Ivan Aivazovsky. “Black Sea at night” An original cult in the work of Ivan Aivazovsky is the image of the sea. The artist grew up in Feodosiya near the sea, from childhood it attracted the artist, was the object of his admiration, and then the images. The Black Sea is the main object of Aivazovsky’s paintings. He writes it in different states, conveying in his works not only a realistic image, but also psychologism. All his landscapes are filled with philosophy, reflections on life. All this speaks about the dreamy and emotional nature of the artist. The painting “Black Sea at night” is a beautiful sea landscape. The bright moon, like the night sun, shines all around, and the water seems to be filled with its glow. Clouds, also illuminated by moonlight, make this night landscape lighter. Playing with light is the artist’s favorite technique. It is with the help of light you can convey the beauty of the sea surface, the volume of waves, slowly running in the sea. Despite the movement of the waves, the picture is filled with the spirit of tranquility. The ship goes smoothly to the place of its arrival. It is depicted in the distance, because of which the sea space visually becomes endless. The moon seems to direct the ship, it is like a constant companion accompanying the ship on its long journey. The whole color of the picture consists of laconic colors. Using a small number of shades, the artist realistically conveys the state of nature. The horizon line brightly separates the sea from the heavenly space, which, in comparison with the brightly lit surface of the water, seems like a black abyss. The great beauty and power of nature is transmitted in this landscape, and a small ship is a defenseless toy in the hands of this power, because at any moment it can be a victim of this element. 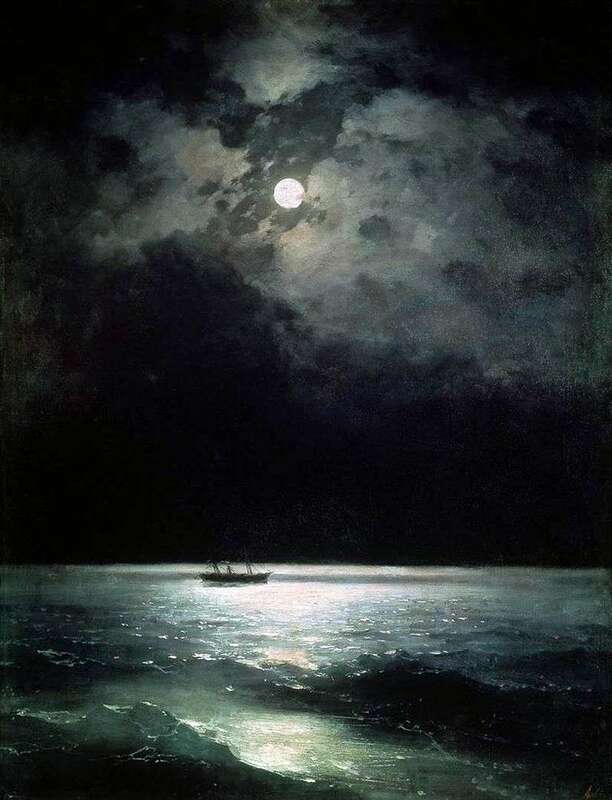 Description and meaning of the painting Black sea at night by Ivan Aivazovsky.